I always struggle with gifts, I never know what to get anyone, specially when it comes to gift exchanges or white elephant. This year, I basically bought all my gifts through Amazon.com. It helped me avoid all the crowds in the stores. While I was browsing a picture of a cooper mug appeared and thought it will be a great gift! 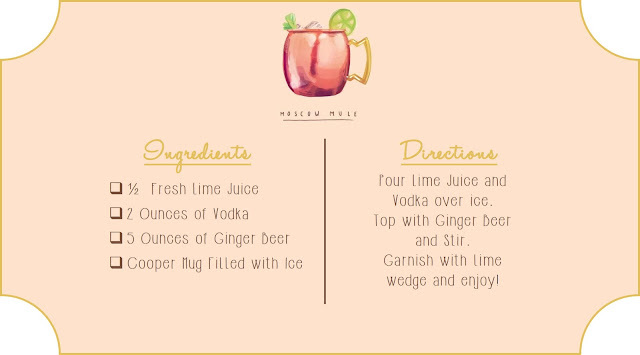 To make it even better I added the recipe as well as the ingredients (except the lime). It was a Moscow Mule Kit. I re-purposed an old shoe box to place them, everything fit perfectly. This is a great non expensive gift! Plus, you can buy it at any liquor store, I assure it is less packed than the mall. You can also create other kits like Margarita glasses with the mix, Martini, etc.. Whatever drink you think they'll enjoy the most. You can print the Moscow Mule recipe I created. Save as an image and print!